Greetings, dear readers! I hope you have been enjoying the weekend! It's been pretty quiet around here, but that's always a good thing! Now on to today's blog post! About six months ago, I shared the beautiful CRABS!!! by I,A.M...Custom Color Cosmetics (IAMCCC). CRABS!!! was created as a Facebook group birthday custom, and for today's post, I present a new version: Tree Crabs!!!! Tree Crabs!!! is a teal green jelly polish loaded with pink-red-green UCC flakies, holo flakies, and iridescent chameleon glitters in assorted sizes. Shown with three coats and top coat, this polish applies so beautifully even with all the flakies and glitters! There was no digging needed and I had no issues with clumping flakies or glitters. Tree Crabs!!! has been released as part of an enchanted forest-inspired duo alongside Fire Peacock and is available for purchase now. These polishes can be purchased individually for $12 each, or you can pick up the duo for the discounted price of $22. Please note that both shades are limited edition, and once they sell out, they will no longer be available for purchase. While Tree Crabs!!! has a similar look to CRABS!! !, you can see they each bring something a little different to your finger tips. I personally think they are different enough from each other to warrant owning both if you're on the fence as to whether or not you need both shades if you already have the previously-released CRABS!!!. I love the look of CRABS!! !, but I think I am more drawn towards the warmth of Tree Crabs!!!. You can pick up this beautiful flakie-filled polish from I, A.M...Custom Color Cosmetics here. Just a reminder that bottles are available in very limited supply so if you're thinking of picking this up, you may want to jump on it sooner rather than later. Are you planning to pick up Tree Crabs!!!? 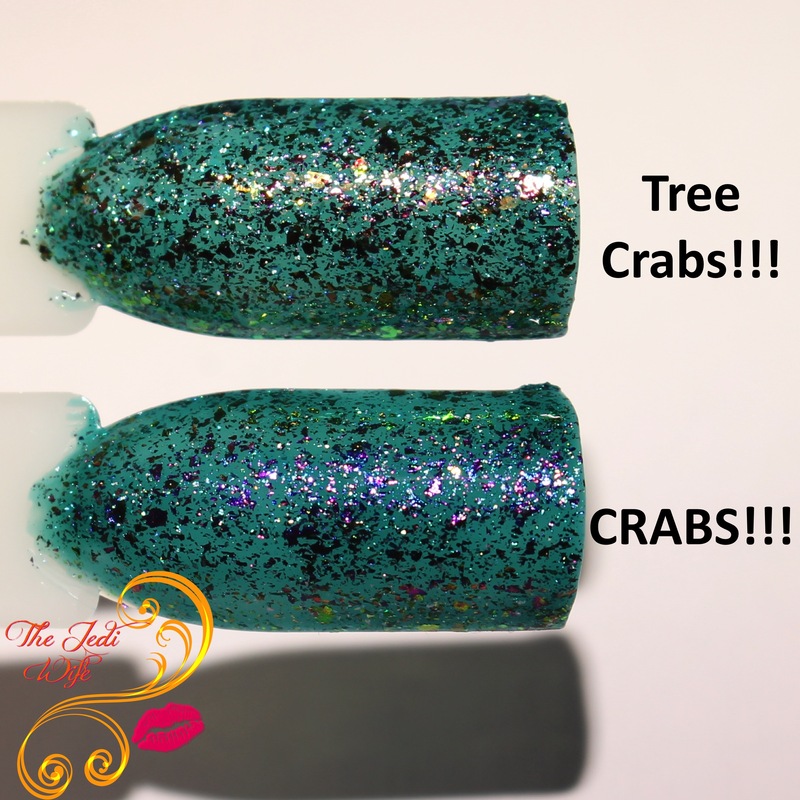 Do you already have the original polish, CRABS!!!? I'd love to hear which one is your favorite! I absolutely love the way Tree Crabs looks. Such a great color combo together. The flakes pair perfectly with the base - love it! These are both gorgeous! I think I like the cooler CRABS the best, but I'd wear either one. Also love the urgency of the names. I think I like Crabs better with that bit of purple. Fun that she updated it with a small twist. Wow - look at all that GLITTER! Such a unique combo!!! I love the jelly base with all those flakes!! !